Find a Freddie Mercury Tribute Act for hire near you in minutes! Option 1. Enter your event location below & contact a Freddie Mercury Tribute Act directly! Option 2. Request multiple quotes from available Freddie Mercury Tribute Acts Get Quotes! Option 3. Read information & advice on hiring Freddie Mercury Tribute Acts Read Advice! WANT TO KNOW MORE ABOUT Freddie Mercury TRIBUTE acts? Read on for the most comprehensive guide to booking a Freddie Mercury Tribute Act, including how much a Freddie Mercury Tribute Act costs, exactly what they will do at your event, plus tips, advice and information to help make your event one to remember! What exactly will a Freddie Mercury TRIBUTE ACT do at your event? Freddie Mercury was possibly the greatest frontman of all time, which poll after poll constantly reveals. He was, of course, famous for fronting the globe conquering Rock band, Queen, but Freddie also enjoyed huge success as a solo artist! Hire a Freddie Mercury Tribute Act for your event and you’ll get a professional performer who will mimic that powerful Freddie Mercury vocal, as well as dressing like Freddie with that famous Freddie handlebar moustache, yellow leather jacket and sports trousers! When you think of Freddie Mercury, you may consider his wonderful stage presence and crowd interaction. Well, hire a Freddie Mercury impersonator and you will get a talented frontman who will incorporate all of this in the act! Giving you a show that’ will be just like attending a real Queen concert or a real Freddie Mercury solo show! Showmanship aside, you can expect to hear Queen songs and Freddie Mercury solo hits alike such as ‘Let’s Turn it On’, ‘i want to break free’, ‘I was born to love you’, ‘Fooling’ Around’, Bohemian Rhapsody’, ‘Mr Bad Guy’, ‘Love Kills’, ‘We will Rock You’, ‘Living on My Own’, and the sparkling duet Freddie sung with the amazing Opera singer Montserrat Caballe, ‘Barcelona’. 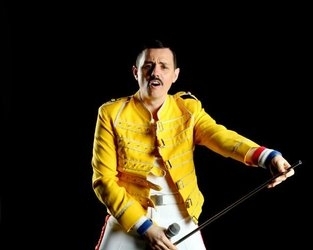 Mainly, a Freddie Mercury Tribute Act will entertain your audience with a fantastic live show that will put the wow factor into celebrations and impress your guests, whatever their entertainment tastes may be. What event types are Freddie Mercury Tribute acts hired for? By hiring a Freddie Mercury Tribute Act, you’ll have someone who will have access to not only Freddie Mercury’s glittering solo music, but also all of Queen’s amazing albums too! This is exactly why a Freddie Mercury Tribute Act would be ideal for the musical entertainment at a wedding ceremony! The hired Freddie Mercury lookalike can be set up to sing as the wedding guests are entering the wedding ceremony venue, be it a church, registry office or even a beach! We suggest opening the ceremony with a nice, ambient song such as ‘Barcelona’. The majestic qualities of this song will really help set the tone of this precious moment! After family and friends have entered, how about hiring the Freddie Mercury Act to sing as the bride is walking own the aisle? For this momentous scene, we would suggest something such as ‘These are the Days of Our Lives’, or the romantic ‘I was Born to Love You’. Once the happy couple have been married, why not make the most of your hired Freddie Mercury and suggest he sings something uplifting like ‘A Kind of Magic?!’. This can be sung live just as the coupe kiss! What a perfect way to celebrate the happiness of two loved ones! The wedding drinks reception would be an excellent time of the wedding day to hire a Freddie Mercury Tribute to sing some unplugged versions of Queen’s songs! There was nearly always a section in live Queen concert dates where Freddie Mercury would sit down at the piano and perform a few songs by himself. The wedding drinks reception would be a great time of the day to do this! We would suggest to request stripped down versions of songs such as ‘Play the Game’, ‘You’re my best Friend’, ‘Radio Gaga’ and ‘Somebody to Love’. This would be the ideal soundtrack to all the socialising between the wedding guests! 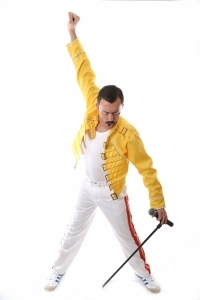 How about hiring a Freddie Mercury Tribute Act for your wedding breakfast entertainment? Freddie Mercury was a singer who had a mass appeal and who covered many genres, so they would be a sure fire hit for your wedding breakfast crowd! They can be performing live music as family and friends are entering the wedding breakfast venue and they can carry on right throughout the celebrations as guests enjoy the wedding courses and fizz! For this special time, we would suggest easy-going songs such as ‘Love of my Life’, ‘Crazy little thing called Love’, ‘Friends will be Friends’ and many, many more! A Freddie Mercury Tribute would be a fantastic choice for your wedding evening drinks entertainment due to the fact that Freddie’s music covered Disco, Rock, Pop, Glam, Piano ballads and more! This means that everyones musical tastes will be covered in some form or another! For the wedding evening reception, we would suggest to bring out the big songs such as the stunning ‘Bohemian Rhapsody’, ‘Seven Seas of Rhye’, ‘Radio Gaga’, ‘Killer Queen’, Barcelona’, ‘The Great Pretender’, ‘Bicycle Race’ and many more! If you wanted a brilliant live act to perform for the couples first dance, then a Freddie Mercury Act will also have this covered! For this, we would suggest something like ‘You take my breath away’. Or, how about getting funky and requesting they perform ‘Another One Bites the Dust?!’. The popularity of Freddie Mercury and Queen shows no signs of slowing down! A whole new, younger audience have been introduced to this wonderful music simply from the massive Queen musical ‘We will Rock You’, which was shown at London’s West End for over 10 years. A new generation are also able to book tickets to see Brian May and Roger Taylor play during Adam Lambert and Queen live tour dates! Coupled with Queen having constant video and radio play, Freddie Mercury has legions of fans ranging from all ages. This is why you may want to hire a Freddie Mercury Tribute Act for your trade show or product launch! The music of Queen and Freddie Mercury is spirited and uplifting, making it an excellent choice of music to link your product to! How about hiring a Freddie Mercury Tribute Act for a work party?! It doesn’t matter if it’s a work Summer party, work Christmas party or a colleague’s leaving bash, a Freddie Mercury Tribute will bring the house down with classic songs that everybody will know! Songs such as ‘We will Rock You’ and ‘Radio Gaga’ will conjure up fantastic crowd interaction moments, as seen on ‘Queen: Live at Wembley’, where Freddie entices the audience to clap and sing along! What a brilliant ice-breaker a Freddie Mercury impersonator will be for co-workers from different departments who don’t always get the chance to chat at work! Freddie was known for his love of partying and clubbing, hence why you might want to book a Freddie Mercury act for a club night! ‘Living on my Own’ was a massive hit in the club scene when it was first released and is still regularly played at club nights so you can bet that a Freddie Mercury lookalike will be well received at a club night! If you know someone who is mad about all things Freddie, then treat them to a Freddie Mercury Tribute show at their birthday party! You can hire the Freddie Mercury Tribute to perform with a live band where they will sing songs such as ‘Somebody to Love’ and the irresistible ‘Don’t Stop me Now!’. Searching for Freddie Mercury Tribute Acts for a 1970’s themed party? Well, we don’t blame you! Freddie made his name as the theatrical singer of Queen in the 1970s so a Freddie impersonator will be very well suited to your 70s party! How about hiring a Freddie Mercury for a 1980s themed party? Freddie really come into his own in the 1980s and embraced the club scene fully! How much do Freddie Mercury tribute acts cost to hire? Our simple to use entertainment directory allows you to firstly search for the best Freddie Mercury Tribute Bands who are local (or travel to your area) and then via the contact form you may message them directly to enquire for a no obligation quote to perform at your event. Some acts will also add a rough price guide to their profile for your convenience. What are the usual set formats and performance lengthS for Freddie Mercury tribute acts? A Freddie Mercury Tribute Band can tailor their performance times to suit you and your event, however, on average, a professional Freddie Mercury Tribute Act will perform for two 45 minutes sets. How much space will a Freddie Mercury tribute act need at your event? If your Freddie Mercury Tribute Act comes as part of a full band, then you will need space for a full band back-line. This will mean that you’ll need a stage area of at least 4 metres by 3 metres. What equipment and set up requirements do Freddie Mercury tribute acts need? As with most artists who sign up to Entertainersworldwide.com, a Freddie Mercury Tribute Band will provide all of their own equipment. You may want to enquire if they need a PA to amplify their sound, in which case we would advise to use our easy to use messaging service to find out. We do ask that each performer gets a backstage area in which they can prepare for the performance ahead. If your venue does not have a backstage area, then we kindly ask that you enquire with the venue to seek an alternative space in which the performer can comfortably get ready to entertain. How can you find and book an Freddie Mercury tribute acts with Entertainersworldwide.com? 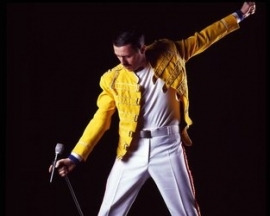 WANT TO RECEIVE A RANGE OF QUOTES FROM Freddie Mercury Tribute Acts?